Health benefits associated with fermented milk products can be attributed to the bacterial starter culture or to the dietary adjuncts added after to the fermented product. Infectious diseases are the biggest problems for human beings in today’s world. Every year gastrointestinal infections lead to significant morbidity and mortality worldwide. Consumption of fermented dairy products improve host metabolism by maintaining balance of the intestinal micro flora and may thus have a positive effect on the host. Improved digestion of lactose, aid in control of serum cholesterol levels, antagonistic action toward pathogens and control of certain types of intestinal cancer are the primary potential health benefits associated with fermented products. Among all milk fermented products, yoghurt is a well-known and more common product and has more acceptability as compared to other products in the world. Yoghurt is easily digested (because milk protein, fat and lactose components undergo partial hydrolysis during fermentation), has high nutritional value and is a rich source of carbohydrates, protein, fat, vitamins, calcium, and phosphorus. This part of the review presents some of the cases of fortification of yoghurt along with their benefits and drawbacks. The practice of fortification of yoghurt with health promoting additives is gaining popularity and is expected to fulfill more nutritional needs also. Intestinal micro flora, Fermentation, Yoghurt, Fortification, Additives. Yoghurt is a product of the lactic acid fermentation of milk by addition of a starter culture containing Streptococcus thermophilus and Lactobacillus delbrueckii ssp. bulgaricus. In some countries less traditional microorganisms, such as Lactobacillus helveticus and Lactobacillus delbrueckii ssp. lactis, are sometimes mixed with the starter culture [1-4]. Other lactic acid bacteria, in particular those from the genera Lactobacillus, Streptococcus, Leuconostoc, and Bifidobacterium  can be combined with yoghurt starters to produce fermented milks with specific desirable characteristics, such as new flavor . In addition, some lactic acid bacteria are included for their probiotic properties. “Probiotic bacteria are defined as live microorganisms that, when administered in adequate amounts, confer a health benefit on the host beyond inherent basic nutrition” . Although fermented milk products such as yoghurts were originally developed simply as a means of preserving the nutrients in milk, it was soon discovered that by fermenting with different microorganisms, an opportunity existed to develop a wide range of products with different flavors, textures, consistencies and more recently, health attributes. Like milk, yoghurt is a healthy and delicious food due to its high nutritive and therapeutic value . Yoghurt is an excellent source of calcium and high-quality protein. But it contains very little iron, which is common among all dairy products . Yoghurt is considered as healthy food due to its high digestibility and bioavailability of nutrients and also can be recommended to the people with lactose intolerance, gastrointestinal disorders such as inflammatory bowel disease and irritable bowel disease, and aids in immune function and weight control [4,10]. Yoghurt is valued for controlling the growth of bacteria and in curing of intestinal disease like constipation, diarrhoea and dysentery, anti-carcinogenic effect and lowering of blood cholesterol . Because of these health benefits associated with yoghurt consumption, there is an increasing trend for yoghurt consumption and is the fastest growing dairy sector in the market, in particular, standard yoghurt and yogurt drinks . The market now offers a vast array of yoghurts to suit all palates and meal occasions. Yoghurts come in a variety of textures (e.g. liquid, set and stirred curd), fat contents (e.g. regular fat, low-fat and fat-free) and flavors (e.g. natural, fruit, cereal, chocolate), and can be consumed as a snack or part of a meal, as a sweet or savory food. This versatility, together with their acceptance as a healthy and nutritious food, has led to their widespread popularity across all population subgroups . Moreover, yoghurt represented $51 billion in global spending in 2011, whereas Switzerland and Saudi Arabia were among the leading per head yoghurt consumers globally that accounts for 28.8 and 22.1 kg of yoghurt per head per year in 2008 . The practice of fortification of yoghurt with iron is gaining popularity and is expected to help fulfill nutritional needs. Yoghurt is generally considered as a safer product and its unique flavor is also so much appealing that consideration is being given by nutritionists to incorporate inexpensive source of nutrients to make it an almost complete food . Manufacturing of yoghurt is an ancient technique, which dates back to thousands of years, and the knowledge has transferred from generation to generation. However, during the last few decades, it has become more rational due to improvement of various fields such as microbiology, biochemistry and food engineering. Today it is a complex activity combined with art and science . The generalized process of yoghurt making is comprised of modifying the original composition of milk, pasteurizing the yoghurt mix, fermentation at thermophilic temperatures (40-45 ºC), cooling and addition of fruits and flavors. The production steps in manufacture of stirred- and set yogurt are illustrated in the Figure 1. Figure 1: Manufacturing process of yoghurt . Yoghurt is a highly nutritious and easily digestible dairy product which is a rich source of more than ten essential nutrients in particular, certain minerals and vitamins. The nutritional composition of yoghurt can be varied according to the strains of starter culture used in the fermentation, type of milk used (whole, semi or skimmed milk), species that milk is obtained (bovine, goat, sheep), type of milk solids, solid non-fat, sweeteners and fruits added before fermentation as well as the length of the fermentation process (Table 1). Table 1. Nutritional composition of different varieties of yoghurt (per 100 g). Lactose is the main carbohydrate found in milk and dairy products and is digested by the enzyme lactase into its absorbable components - glucose and galactose - which are then used as fuel by the body. Lactose mal-digestion or lactose in tolerance occurs when insufficient amounts of the enzyme lactase are available in the gut to digest lactose . This results in undigested lactose passing into the large intestine where it can be fermented by the bacteria in the colon causing adverse gastrointestinal symptoms in some individuals, such as flatulence, diarrhoea and abdominal pain [21,22]. This problem is known as lactose intolerance and is defined as “the occurrence of symptoms after persons with clinically diagnosed lactose maldigestion (lactose intolerance) consume a trigger amount of lactose”. Although the lactose content of yoghurt is naturally lower than milk, research has shown that the lactose that is present in yoghurt is better tolerated by individuals with low production of lactase (hypolactasia) than lactose in an equivalent quantity in milk. This may be due to several factors including the activity of live bacteria in the yoghurt or the digestive action of other enzymes on lactose such as bacterial β-galactosidase. The increased viscosity of yoghurt compared with milk has also been suggested as a potential explanation, as this may result in slower emptying from the stomach and thus a longer transit through the gastrointestinal tract, which in turn may improve the absorption and reduce the amount of lactose present in the colon .Yoghurt is well tolerated by individuals who have lactose intolerance and is important for those suffering from lactose intolerance who often excludes all dairy foods from the diet which can lead to poor calcium intake. Interestingly, studies have suggested  that even in subjects with lactose intolerance, consumption of small amounts of any dairy food, if combined with a meal, is often well tolerated and regular consumption may even reduce symptoms. Obesity is an increasing public health problem in the UK, with one in five adults now classed as obese. Fears about weight gain are often cited as a reason to cut down on the consumption of milk and dairy products. However, contrary to popular belief, research has shown  that people who consume milk and dairy foods are likely to be slimmer than those who do not. Studies have also shown  that consumption of milk and dairy foods as part of a calorie controlled diet is associated with increased weight loss, particularly from the abdomen, since excess fat around the trunk region of the body is associated with greater risks to health. The precise mechanisms involved are unclear but studies  suggest they are likely to involve calcium found in milk, yogurt and other dairy foods. Healthy levels of good bacteria promote digestive health and boost the immune system by creating an environment where bad bacteria are unable to grow . The strains of good bacteria found in freshly made yoghurt can also help the body digest and absorb important nutrients found in your food. This makes yoghurt consumption more beneficial than drinking milk. Once probiotic bacteria are eaten, the bacteria helps with pre-digestion and causes nutrients in the food to be in a better state for digestion and absorption into the body. Probiotic organisms are ‘live micro-organisms which, when consumed in adequate amounts, confer a health benefit on the host’ . To observe a positive health effect of their consumption, a minimum level of live microorganisms is required; this level, depending on the strains used and the required health effect, is usually between 108 and 1011 cfu/d . Fermented dairy products such as yogurt have the ability to support the viability of probiotic cultures and therefore provide a suitable vehicle for their delivery into the body, and are easily incorporated into the diet. Increasingly, yoghurts have been prepared with probiotic microorganisms such as L. acidophilus with varying viability over a range of shelf life . Non-pathogenic (non-harmful) intestinal bacteria play an important role in the normal functioning of the gut and improve resistance to disease; however factors such as changes in lifestyle, diet, increased stress and consumption of antibiotic medications can all lead to changes in the balance of gut bacteria . Diarrhoea often results from disturbances to the natural balance of gut microflora through infection with pathogenic strains of bacteria. The treatment of diarrhoea with probiotics has traditionally been one of the main application areas for probiotics. The best documented evidence exists for shortening the duration of a form of diarrhoea in children known as “rotavirus diarrhoea” by selected probiotic strains . Different strains, including L. reuteri SD2112, L. rhamnosus GG, L. casei DN-114 001, and S. cerevisiae (boulardii) Lyo, tested in controlled clinical trials decreased the severity and duration of diarrhoea. Several metaanalysis of controlled clinical trials have been published that concluded these probiotics are safe and effective . Prevention and treatment of diarrhoea after the use of antibiotics, particularly in the elderly, has also been connected with certain probiotic strains e.g. L. acidophilus, L. bulgaricus and B. longum . Unfortunately many of the trials in this area have been poorly controlled and used low numbers of subjects. Therefore further studies with improved design are needed to determine the full effect of probiotics on the treatment of diarrhoea. The immune system is responsible for protecting us from infection and disease. Some sub groups of the population may have weak immune function such as infants, the elderly, surgical patients, trauma victims, people under stress and HIV positive individuals which reduces their natural protection from illness . Probiotics have been connected to improved immune function in these groups , and the results of human studies indicate that yogurt containing probiotic strains of bacteria can enhance immunity and reduce the incidence of conditions such as cancer, gastrointestinal disorders and symptoms of allergy, although further research is required. The term Inflammatory Bowel Disease (IBD) includes disorders such as Crohn’s disease, ulcerative colitis and pouchitis . These conditions are usually chronic (long term) and go through periods of exacerbation followed by periods of remission throughout the life of sufferers. The cause of the disease is unclear, but several theories suggest it may be due to abnormal responses to certain bacteria in the gut. The current treatment for IBD involves suppression or modulation of the immune system with steroid medications in order to induce remission, or surgery to remove the diseased section of the bowel. However both treatments result in numerous complications for the patient. At present treatments do not address the contribution of the intestinal bacteria (microflora)  to the condition, which is an area where probiotic intervention may prove beneficial. In theory, probiotics have the potential to reduce the immuno-inflammatory responses induced by bacteria that may be responsible for damage to the intestines seen in these conditions. Treatment with the probiotic Esherichia coli Nissle 1917 was reported to be as effective as the standard drug treatments for maintaining remission in ulcerative colitis . Additional studies have found benefits with supplementation of mixtures of several probiotics in inducing remission and preventing relapse of pouchitis, ulcerative colitis and Crohn’s disease. Some practitioners now believe that the evidence is strong enough to prescribe certain probiotics for treatment of inflammatory bowel disease as an alternative to current drug treatments. However most feel that further investigations are required to determine the full therapeutic potential of probiotics before changes are made to current treatment procedures. Irritable bowel syndrome (IBS) is a gastrointestinal condition characterized by abdominal pain, bloating, excessive gas, constipation and diarrhea [40,41]. The type and severity of symptoms experienced varies widely between individuals and, in general, the condition is poorly understood . No test currently exists for IBS and therefore it can only be diagnosed by excluding the presence of other gastrointestinal abnormalities . IBS sufferers are commonly found to have abnormal gut bacteria and this is thought to contribute to the development of the disease . For this reason, the use of probiotics to redress these abnormalities has been suggested as a potential treatment. To date, there have been few studies involving probiotics and IBS, possibly because IBS sufferers are a very diverse group and are therefore difficult to study. The studies that have been conducted so far have produced conflicting results, some with very real improvements in symptoms and some with no change . Although the use of probiotics in the treatment of IBS is currently not justified; more research in this area is certainly warranted because abnormalities seen in the gut bacteria (microflora) of IBS sufferers suggest that a probiotic approach will ultimately be justified. Health benefits associated with the consumption of probiotics are given in Figure 2. 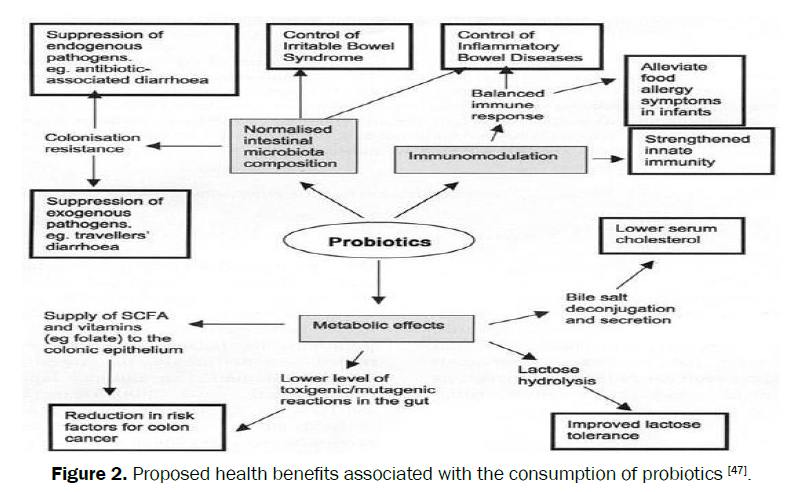 Figure 2: Proposed health benefits associated with the consumption of probiotics . Yoghurt is the most used medium to incorporate probiotic bacteria in foods and, in this regard, research studies  have optimized its sensory qualities to render a palatable product to consumers. Hekmat and Reid  conducted consumer taste panel evaluations to compare the sensory properties of probiotic and standard yogurt. The results showed that the appearance, flavor, texture, and overall quality of probiotic 1% fat yogurt were comparable and similar to standard 1% fat yogurt. Thus, L. rhamnosus yoghurt supplemented with L. reuteri has sensory attributes suitable for human consumption. The yoghurt containing L. paracasei exhibited a rich, smooth, and traditional taste, not too acidic, similar to its regular form, showing good sensory acceptance among consumers. In a recent study, yoghurts were enriched with fiber obtained from the non-edible part of asparagus shoots and fiber obtained from all methods of its processing was found equally prospective for yogurt enrichment . By-products, rich in fiber and bioactive compounds, contribute about 50% of the total weight in the asparagus processing industry, which emphasizes their potential contribution to human nutrition. Hekmat and McMahon , found that the oxidized flavor scores of iron-fortified yogurts were slightly higher than control yogurt, and there was no enhancement in metallic, bitter, or other off-flavors. There was no detectable significant difference in the appearance, mouth feel, flavor, or overall quality of fortified and unfortified yogurts, as observed by the consumer panel. It implied that all yoghurt samples were appreciated by the consumer panelists signifying yoghurt as an appropriate medium for iron fortification. Plain whole yoghurt contains about 120 mg calcium per 100 g . Fortification of yoghurt with calcium is expected to be able to address individuals’ requirements that are at risk of calcium deficiency related disorders. Even when individuals do not consume large amounts of dairy products to meet their calcium requirements, fortification will supply required amount of calcium in 1 or 2 servings. Fortification of low-fat yoghurt with calcium gluconate  is possible with minor physical and chemical changes and no effect on organoleptic properties of the yoghurt . The increasing emphasis on use of natural food additives in diet has promoted the use of honey, which has been gaining interest as a substitute sweetener because of its wholesome image [52,53]. Low pH (approximately 3.9) and ability to decrease sourness of solutions make it an attractive additive for acidic products such as yoghurt. However, combinations of honey with yoghurt are comparatively rare  because of its inhibitory effects on lactic starter cultures [54,55]. Factors related to antibacterial nature of honey are not completely understood , and are expected to be because of “high sugar content” (limiting water available for proper growth of microorganisms), the “relatively high acidity, the presence of organic acids, and the presence, at low concentrations, of hydrogen peroxide” . Floral source of the honey is an important factor influencing its antimicrobial characteristics . Studies have shown that during storage at 4 °C, the characteristic microorganisms (that is, S. thermophilus and L. bulgaricus) in yoghurt are not significantly affected by the presence of honey at 1.0% to 5.0% (w/v) . pH and lactic acid levels of the final products were found unaffected by honey, and it highly improved the sensory characteristics of the final product, with approximately 3.0% (w/v) of honey, without having a negative effect on the lactic acid bacteria. Fortification of non-fat yoghurt with whey protein isolate (WPI) has also been tried  and fortification of yoghurt with sodium caseinate and yogurt texture improver (TI) has also been done. It was observed that yoghurt with WPI did not have desirable sensory properties and the descriptive panel indicated that yoghurt with WPI had the lowest fermented flavor attribute. For the last several decades, marine lipids have received growing interest because of their valuable health effects . Many studies have demonstrated that eicosapentaenoic acid (EPA) and docosahexaenoic acid (DHA) have a positive effect on myocardial infarction and on immune and eye functions [62-64] and in neurological diseases, for instance depression and Alzheimer’s disease . The healthy image of EPA and DHA and the wide consumption of dairy products such as yoghurt support the possibility of use of yoghurt as a vehicle for increasing consumption of fish oil. However, due to the presence of high content of polyunsaturated fatty acids, foods with fish oil are prone to oxidation that might lead to the development of undesirable fishy and rancid off-flavors and may even promote cardiovascular diseases [66-68]. In a separate study , an algal oil emulsion was added to yoghurt mix flavored with a strawberry fruit base, to supply 500 mg ω-3 fatty acids per 272g serving of yoghurt. Cashew apples, a rich source of vitamin C  was used as a nutritional additive in yoghurt making  The yoghurt into which cashew apple had been added “compared favorably” with the reference sample (commercially available Fan Milk yoghurt) in terms of all the attributes evaluated and there was no significant difference. Hassan  manufactured a yoghurt using concentrations of 0.1, 0.2, 0.3, 0.4 and 0.5% of aqueous garlic extract. According to their results, after 15 days of storage, the resultant yoghurt in all different concentrations of garlic had higher values of sensory, texture and aroma than control. Foda  prepared set yoghurt using buffalo milk and supplemented with turmeric powder at different concentrations of 0.1, 0.25, 0.50, 0.75 and 1%. They found an increase in the firmness and viscosity of the yoghurt as the concentration of turmeric increased. Taking into consideration the values from Table 2, the most appropriate percentage of spice juice to be incorporated into a yoghurt product would be between 1-4%. Source: Amagase et al. , University of Maryland-Medical Center 2011 , Blumental et al. .
Table 2. Recommended daily dosages of some spices. Globally, consumers spend $73 billion per year on yoghurt [73-76]. Yoghurt is growing fast, at 7% annually, and is among the top five foods for sales growth. The U.S. market for yoghurt is estimated to be worth $6 billion . In 2009, United States was the second largest market for functional foods, whereas Japan was the first. The functional foods market is expected to increase from $7.1 billion and the yoghurt market increased from $9.7 billion in 2005 to $15.4 billion in 2010  . Highly condensed Yoghurt can be made available in different forms such as drinking yoghurt, lactose-hydrolyzed yoghurt, strained yoghurt, frozen yoghurt (with categories soft, hard, or mousse), dried yoghurt, bio-yoghurt (yoghurt made with different live cultures other than the 2 most widely used ones), vegetable oil yoghurt, soy yoghurt, and chemically acidified yoghurt  and yoghurt has always been successful in making people enjoy the products. Ever-growing consumer demand for convenience, combined with a wholesome diet and preference for natural ingredients, has led to growth in the functional beverage market. Current trends and changing consumer needs indicate a great opportunity for innovations and developments in fermented milks. While scientific and clinical evidence is mounting to corroborate the consumer perception of health from fermented milks, the probiotics, prebiotics, synbiotics, and associated ingredients are able to add an attractive dimension to cultured dairy products. The compounds responsible for yoghurt aroma can be used as additives. Within the prescribed range, 1-nonen-3-one can be added to food, pharmaceutical, cosmetic, and perfume compositions to flavor the products and to impart aroma, particularly to dairy products and coffee extract. The 1-nonen- 3-one can also be combined with other compounds that provide taste and aroma, and the combined compounds can be added to the compositions . The application of yoghurt to prepare baked goods such as bread has been patented, which are reported to have improved flavor and other properties that can be obtained by incorporating yoghurt in the dough . Owing to expanding market size of dairy companies, there has been merging of dairy products and fruit beverage markets with the introduction of “juice ceuticals” such as fruit-yoghurt beverages that are typical examples of hybrid dairy products which are able to offer health, flavor, and convenience at the same time. Another potential growth area for fermented milks includes value-added products such as low-calorie, reduced-fat varieties, and those fortified with physiologically active ingredients, including fibers, phyto-sterols, omega-3-fatty acids, whey-based ingredients, antioxidant vitamins, and iso-flavones that provide specific health benefits beyond basic nutrition. Continuous efforts are being made to develop yoghurt containing certain nonconventional food sources such as soybeans and millet and convert them to more acceptable and palatable forms thus producing low-cost, nutritious fermented foods. Use of bio-preservatives and certain innovative technologies such as membrane processing, high-pressure processing, and carbonation can lead to milk fermentation under predictable, controllable, and precise conditions to yield hygienic fermented milks of high nutritive value , which can help to further improve the industry and add value [82-84]. Yoghurt has been a part of human diet in many parts of the world because of acceptance of its taste (along with remarkable beneficial effects). With the advancement of technology, it is now common to find different types of flavors such as peach, red fruits, lemon, apple, and so forth. Aroma additions provide various flavor possibilities in the dairy market that has increased the popularity of products such as yoghurt, milk drinks, desserts, and others. To satisfy consumer demands, manufactures increasingly yoghurts with reduced fat content replaced by thickeners and gelling agents and can lead to change in the distribution of flavor molecules. Yoghurt is a major source of nutrients for both vegetarians and non-vegetarians also be effective in cytokine production, T-cell function and natural killer-cell activity, and thereby result an overall immunological enhancement . Culligan EP, et al. Probiotics and gastrointestinal disease: successes, problems, and future prospects,Gut Pathogens2009; 1:1–12. Chee CP, et al. Chemical and sensory analysis of strawberry-flavoured yogurt supplemented with an algae oil emulsion, J Dairy Res 2005; 72:311–316. European Journal of Clinical Nutrition 56: 2- 15. McKinley MC. The nutrition and health benefits of yoghurt – review, Society of Dairy Technology 2005; 58: 1– 12. Robinson RK. Yogurt types and manufacture. 1991:1055–1058. Hartley DL and Denariaz G. The role of lactic acid bacteria in yogurt fermentation, Int J Immunother 1993; 9:3–17. Schaafsma G. State of the art concerning probiotic strains in milk products, Nutr News 1996;145:23–24. Perdigon G, et al. Role of yoghurt in the prevention of colon cancer,Eur J ClinNutr2002; 56: 565-568. Blanc B. Biological aspects of human milk composition with bovine milk. World Rev Nutr Diet 1981; 36:1-89. Lourens-Hattingh A and Viljoen BC. Yogurt as probiotic carrier food, International Dairy Journal2001; 11: 1-17. Kamruzzaman M, et al. Evaporation rate of moisture from Dahi (yoghurt) during storage at refrigerated condition, Pak J Nutr2002; 1: 209-211. National Yogurt Association. Yogurt: Wholesome Food for Every Body 2013. Ranjan S. Sensory quality aspects of yogurt. Dairy Australia/NCDEA 2013. Tamime AY and Robinson RK. Yoghurt science and technology. 3rd ed. Abington, Cambridge, England: Woodhead Publishing Ltd. LLC, NW, U.S.A.: CRC Press 2007; 791. Lee W J andLucey J A. Formation and physical properties of yogurt. Asian-Aust,J. Anim. Sci, 2010; 23: 1127-1136. The Dairy Council. The Nutritional Composition of Dairy Products. London 2013. O’Hara AM and F Shanahan. Mechanisms of action of probiotics in intestinal diseases,Sci World J 2007;7:31–46. SheilBF, et al. Probiotic effects on inflammatory bowel dis­ease,J Nutr2007;137:819S–824S. KolarsJC, et al. Yogurt—An autodigesting source of lactose,New Engl J Med 1984;310:1–3. McFarland L V. Meta-analysis of probiotics for the prevention of antibiotic associated diar­rhea and the treatment of Clostridium difficiledisease, Am J Gastroenterol2006; 101(4):812–822. Sazawal SG, et al. Efficacy of probiotics in prevention of acute diarrhoea: A meta-analysis of masked, randomised, placebo-controlled trials. Lancet Infect Dis 2006; 6:374–382. De VreseMA, et al. Probiotics—compensation for lactase insuffi­ciency,Am J ClinNutr2001; 73:421S–429S. Krauss RM, et al. Separate effects of reduced carbohydrate intake and weight loss on atherogenic dyslipidemia, Am J Clin Nutr.2006;83:1025–1031. Guyonnet D, et al. Effect of a fermented milk containing Bifidobacteriumanimalis DN-173 010 on the health-related quality of life and symptoms in irritable bowel syndrome in adults in primary care: a multicentre, randomized, double-blind, controlled trial,Aliment. Pharmacol. Ther.2007;26 (3): 475–486. Reid G, et al.Potential uses of probiotics in clinical practice,Clin. Microbiol. Re.2003;16:658–672. FAO/WHO. Guidelines for the evaluation of probiotics in food. Report of a joint FAO/WHO working group on drafting guidelines for the evaluation of probiotics in food. London ON, Canada 2002. Vanderhoof JA. Probiotics in allergy management, Journal of Pediatric Gastroenterology and Nutrition2008; 47: S38–40. Savino F E, et al.Lactobacillus reuteri(American Type Culture Collection Strain 55730) versus simethicone in the treatment of infantile colic: A prospective randomized study. Pediatrics 2007;119:e124–130. Rasic J and Kurmann J. Flavor and aroma in yoghurt. In: Rasic J, Kurmann J, editors. Yoghurt. Scientific grounds, technology, manufacture and preparations. Copenhagen, Denmark, Tech Dairy Publ House distributors 1978; 90-98. Lidbeck A, et al. Lactobacilli, anticarcinogenic activities and human intestinal microflora, Eur. J. Cancer Prev. 1992;1:341–353. Ouwehand AC, et al. Probiotics: Mechanisms and established effects,Intl Dairy J 1999;9:43–52. Marteau P, et al. Nutritional advantages of probiotics and prebiotics, British Journal of Nutrition, 2002;87: S153–S157. SzajewskaHM, et al. Efficacy of LactobacillusGG in prevention of nosocomial diarrhea in infants,J Pediatr2001; 138:361–365. Van Loo J, et al. The SYNCAN project: goals, set-up, first results and settings of the human intervention study, Br. J. Nutr 2005; 92:91–98. Hatakka K, et al.Effect of long term consumption of probiotic milk on infections in children attending day care centres: double blind, randomised trial,BMJ2001;322:1327. Rembacken BJ, et al. Non-pathogenic Escherichia coli versus mesala­zine for the treatment of ulcerative colitis: A randomised trial,Lancet1999; 354:635–639. Kato KS, et al. Randomized placebo-controlled trial assessing the effect of bifidobacteria-fermented milk on active ulcerative colitis,Aliment PharmacolTher2004;20: 1133–1141. KruisWP, et al. Maintaining remission of ulcerative colitis with the probiotic Esch­erichia coli Nissle 1917 is as effective as with standard mesalazine,Gut 2004;53:1617–1623. Kim HJ, et al. A randomized controlled trail of a probiotic, VSL#3, on gut transit and symptoms in diarrhoea-predominant irritable bowel syndrome, Aliment. Pharmacol. Ther 2003; 17: 895–904. Nobaek S, et al. Alteration of intesti­nal microflora is associated with reduction in abdominal bloating and pain in patients with irritable bowel syndrome, Am J Gastroenterol2000; 95:1231–1238. Whorwell PJ, et al. Efficacy of an encapsulated probiotic Bifidobacteriuminfantis35624 in women with irritable bowel syndrome,Am. J. Gastroenterol.2006;101:1581–1590. Niedzielin K, et al. A controlled, double-blind, randomized study on the efficacy of Lactobacillus plantarum 299V in patients with irritable bowel syndrome, Eur J GastroenterolHepatol2001;13: 1143–1147. O’Mahony, et al. Probiotic impact on microbial flora, inflammation and tumour development in IL-10 knockout mice, Alimentary Pharmacology and Therapeutics 2005;15: 1219–1225. KajanderK, et al. A probiotic mixture alleviates symptoms in irritable bowel syndrome patients: A controlled 6-month intervention,Aliment PharmacolTher 2005; 22:387–394. Hekmat S and Reid G. Sensory properties of probiotic yogurt is comparable to standard yogurt,Nutr Res Rev 2006; 26:163–166. SaarelaM, et al. Gut bacteria and health foods – the European perspective,International Journal of Food Microbiology 2002;78: 99–117. Sanz T, et al. Yogurt enrichment with functional asparagus fibre. Effect of fibre extraction method on rheological properties,colour, and sensory acceptance,Eur Food Res Technol A 2008;227:1515–1521. Hekmat S and McMahon DJ.Manufacture and quality of iron-fortified yogurt, J Dairy Sci1997;80:3114–3122. Pirkul T, et al. Fortification of yoghurt with calcium salts and its effect on starter microorganisms and yoghurt quality, Int. Dairy J 1997; 7:547–552. Fligner K, et al. Fortification of low-fat plain yogurt with calcium gluconate, Cult. Dairy Prod. J. 1988;23:5–9. Chick H, et al. Growth and acid production by lactic acid bacteria and bifidobacteria grown in skim milk containing honey, J Food Sci2001;66:478–481. Ustunol Z and Gandhi H. Growth and viability of commercial Bifidobacteriumspp. in honey-sweetened skim milk, J Food Prot2001;64:1775–1779. Roumyan N, et al. On some aspects of a new fermented milk product medina,BiotechnBiotechnol Equip 1996;10:86–89. Curda L and Plockova M. Impedance measurement of growth of lactic acid bacteria in dairy cultures with honey addition,Int Dairy J 1995; 5:727–733. Taormina PJ, et al. Inhibitory activity of honey against foodborne pathogen as influenced by the presence of hydrogen peroxide and level of antioxidant power,Int J. Food Microbiol2001; 69 :217-225. Mundo MA, et al. Growth inhibition of foodborne pathogens and food spoilage organisms by select raw honeys,Int J Food Microbiol2004; 97:1–8. Molan PC. The antibacterial activity of honey: The nature of the antibacterial activity, Bee World 1992;73:5–28. Varga L. Effect of acacia (Robinia pseudo-acacia L.) honey on the characteristic microflora of yogurt during refrigerated storage,Int J Food Microbiol2006;108:272–275. Isleten M and Karagul-Yuceer Y.Effects of dried dairy ingredients on physical and sensory properties of nonfat yogurt, J Dairy Sci2006;89:2865–2872. Nielsen NS, et al. Oxidative stability of fish oil enriched drinking yoghurt, Int Dairy J 2007;17: 1478–85. Schmidt EB, et al. Long-term supplementation with n-3 fatty acids, II: effect on neutrophil and monocyte chemotaxis,Scand J Clin Lab Invest 1992;52:229–36. Werkman SH and Carlson SE. A randomized trial of visual attention of preterm infants fed docosahexaenoic acid until nine months. Lipids 1996;31:91-97. Marchioli R, et al. Dietary supplementation with n-3 polyunsaturated fatty acids and vitamin E after myocardial infarction: results of the GISSI-Prevenzione trial, Lancet 1999;354:447–455. Morris MC, et al. Consumption of fish and n-3 fatty acids and risk of incident Alzheimer disease, Archives Neurol2003;60:940–946. Das UN.Oxyradicalsand their clinical implications,CurrSci1993;65:964–969. Jackson LS and Lee K. Fortification of cheese with microencapsulated iron, Cult Dairy Prod J 1992;27:4–7. Shimoni N, et al. Cardiovascular diseases in patients with high levels of plasma high-density lipoprotein: association with increased plasma oxidative state, Israel Med Assoc J 2003;5:702–5. Akinwale TO. Cashew apple juice: its use in fortifying the nutritional quality of some tropical fruits,Eur Food Res Technol 2000; 211:205–207. Aroyeun SO.Optimisation of the utilisation of cashew apple in yogurt production,Nutr Food Sci2004;34:17–19. Hassan FAM, et al. Production of healthy yoghurt by using aqueous extract of garlic,Arab Universities Journal of Agricultural Sciences2010;18: 171-177. Foda MI, et al. Chemical, rheological and sensory evaluation of yoghurt supplemented with turmeric,International Journal of Dairy Science 2007; 2: 252-259. Amagase H, et al. Recent advances on the nutritional effects associated with the use of garlic as a supplement, J. Nutr 2001;131: 1120S-1123S. University of Maryland-Medical Centerc. Turmeric Recovered on March 10, 2011. Blumenta M. The Complete German Commission Monographs, vol. 62. Austin, TX: American Botanical Council: 1998; 135-136. General Mills annual report Accessed July 2013. Danisco news release (2013) Accessed July 2014. Heller L. Probiotics and health to drive US yogurt market”. William Reed Business Media SAS. Recovered on February 1, 2011. Ott A, et al. Use of 1-nonen-3-one for aroma/flavor enhancement. United States Patent 6,296,889 2001. Hill LG, et al. Yogurt-containing dough composition and baked product made therefrom. United States Patent 1974;3:846,561. Khurana HK and Kanawjia SK. Recent trends in development of fermented milks, CurrNutrFood Sci 2007; 3:91–108. H Roginski, et al.Dairy Sciences ed. Vol.2. Academic Press, NY. Let MB, et al. Oxidative flavor deterioration of fish oil-enriched milk,Eur J Lipid SciTechnol2003;105:518–528. Spiegel JE, et al. Safety and benefits of fructooligosaccharides as food ingredients, Food Technol1994;48:61–65.